The meat and potatoes of Sontag: Reborn are from Reborn: Journals and Notebooks, 1947-1963, the first of three volumes of Sontag’s journals, published by her son, David Rieff. The production examines her life through 1964 – just before she published Notes On “Camp’. Actor and adaptor, Moe Angelos, becomes the title character in a duet with Sontag’s older and younger selves. Her performance is amplified by two projection screens, a typewriter, voice overs, and a live feed ceiling camera. The end product is cinematic in its visual complexity. Angelos’ memorization of text and cues is incredible. Her co-performer (a video of herself as a mature Sontag) gives her no aid aside from the prerecorded cues. It is up to Angelos to unite the production and to cue lights and sound. She held the intense performance together with aplomb and vivacity. It is noted in Sontag:Reborn that Susan edited all of her journals – an indication that she either knew they would one day be published or of OCD tendencies. Her audience is left with the conclusion that her’s was a self-aware genius: she understood her own brilliance even when she lacked confidence in it. It is imperative that the audience understands this in order to appreciate the production. Sontag’s drive for accomplishment is impressive at any age. The audience feels her burden to disallow her intellect to dominate her life over physical self-discovery. She had to give herself permission to live in her body as well as her mind as if she were an experiment and her body was the control group. Her struggle for fulfilling stimulation was constant. 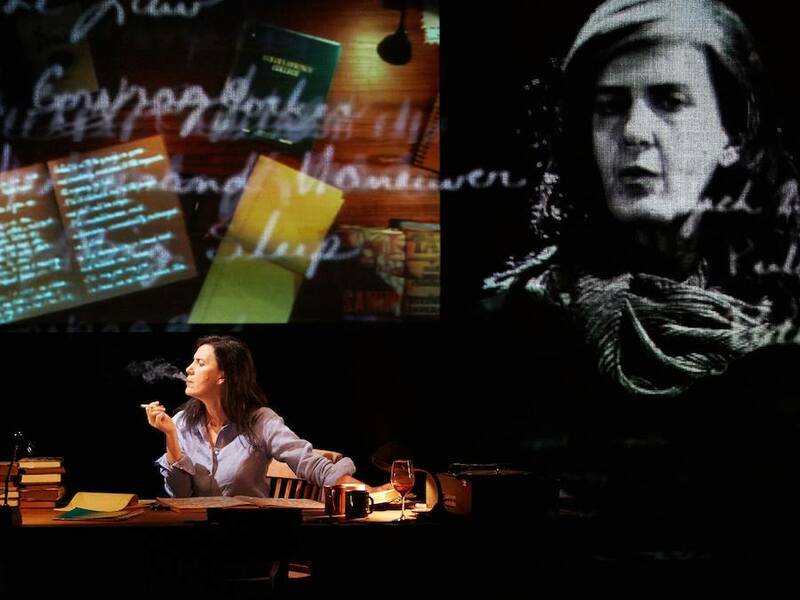 This production has no discernible plot aside from the events of Sontag’s life. It starts and ends abruptly like her journals. Life doesn’t have a plot that begins epically and resolves by the end. Sontag could edit her journals over time. To preserve the integrity of Sontag’s personal writings, this element of style was maintained. There is a great deal of name dropping in Sontag:Reborn. Sontag kept long lists of accomplishments, people she met, books she read, music she appreciated or didn’t, and movies that inspired her: a catalogue of her successes. Parts of this production feel like a dramatic reading of the phone book; dull but remarkable. In her journals, she was focused on her experience and growth. This production aims to examine her working mind. It is deeply personal and, like many deeply personal things, not for everyone. This entry was posted in Drama and tagged 2014, ArtsEmerson: The World On Stage, As Consciousness is Harnessed to Flesh, Boston, David Rieff, feminist, James Gibbs, lesbian, MA, Marianne Weems, May, Moe Angelos, New York Theatre Workshop, Notes On “Camp’, Paramount Mainstage Theater, Reborn, Shannon Sindelar, Sontag: Reborn, Susan Sontag, The Builders Association by Kitty Drexel. Bookmark the permalink.